Will Rick Perry Skip Future GOP Debates? : It's All Politics A spokesman for Texas Gov. Rick Perry raised the idea that he might not compete in all of the upcoming Republican face-offs. Weak debate performances have put a dent in his polling — and his fundraising. Do you feel like there have just been too many presidential debates already? Well, Rick Perry might agree with you. 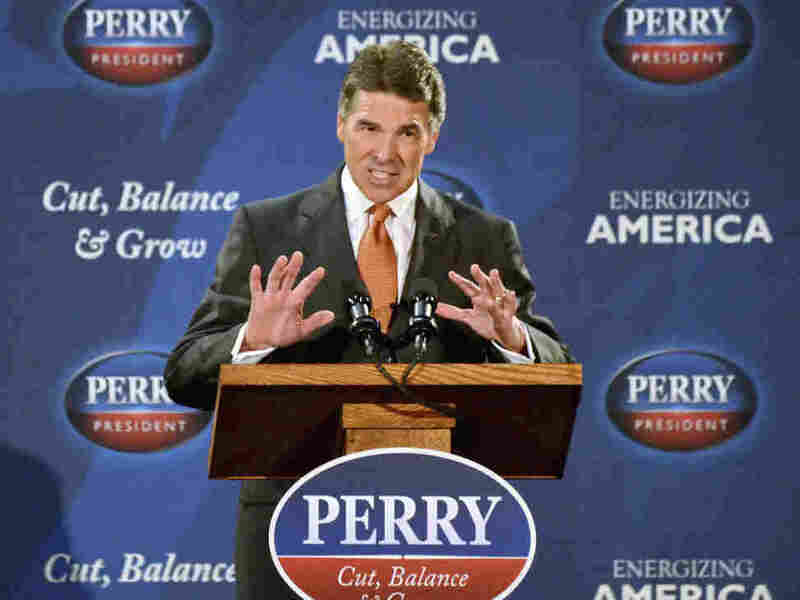 There have been eight Republican debates so far, five since Governor Perry got in. We certainly respect the process, but when you've got 8 or 9 candidates and 30 seconds to a minute, it takes valuable time away from campaigning in Iowa as those elections approach. King followed up to see if that meant Perry would pull out of future debates. Sullivan simply said there's no way for the candidates to participate in all of the debates currently being planned. He put that number at 18. Perry himself has criticized the format of previous debates and accused the planners of gaming the candidates to fight with each other. He's also admitted on several occasions that he's not the smoothest debater. You might take that as a jab at former Massachusetts Gov. Mitt Romney. Romney ran in 2008, and with more practice under his belt, is considered a much smoother candidate by many political watchers. In August, Perry became the last of the current hopefuls to declare his candidacy and quickly shot to first in the polls. He broke above 30 percent in at least two national polls — something no other candidate has been able to accomplish. But once the Texas governor endured several poor debate performances, his numbers slid sharply — and his fundraising dipped. The most recent national poll, from Fox News, has Perry in fourth place with 10 percent. He trails Herman Cain (24 percent), Mitt Romney (20 percent) and Newt Gingrich (12 percent). That poll was conducted after a CNN debate in Las Vegas on Oct. 18. Perry got a lot of attention for being more aggressive in that debate, especially in this interaction with Romney. A Perry spokesperson tells NPR he will participate in the next scheduled debate. That's set for Nov. 9 at Oakland University in Rochester, Mich. But no decisions have yet been made on whether Perry will participate in future debates. No voters have to decide on a candidate until the Iowa caucuses on Jan. 3. That is, unless New Hampshire Secretary of State Bill Gardner pulls a Thanksgiving surprise. But, sometime next week, Gardner is expected to set the New Hampshire primary for Jan. 10.